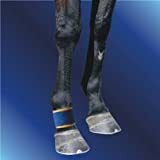 Magnetic therapy uses ceramic ferrite magnets in horse hoof, pastern, fetlock and knee boots to treat pain from osteoarthritis or joint injuries. Magnetic therapy has long been used to promote bone-healing and to treat pain from osteoarthritis. A 2000 analysis of 31 clinical studies found, "The action on bone healing and pain alleviation of electromagnetic fields was confirmed in most of the trials. In the treatment of other disorders the results are contradictory." A 2011 German study concluded, "The evaluation of 17 studies with static magnetic fields showed on average no significant difference in pain relief between the group treated with magnetic fields and the placebo group." 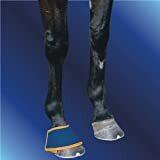 There are a number of magnetic horse hoof and joint boots that are designed to help relieve painful joints due to arthritis or injury.